Member postings for Jose L. G.
Here is a list of all the postings Jose L. G. has made in our forums. Click on a thread name to jump to the thread. Thread: K3736- MkI Fury-Jose L.G. Tony, Danny thanks for your compliments, Much appreciated. Today adjusted the side formers and top/bottom cross-grain sheets. Put all the stringers in the fuse. Left side stringers. The bottom is recessed for the side sheeting. Some of the stringers need to be thinned at the end as indicated in the plan. Right side stringers. Nothing strange to report. Top side view. 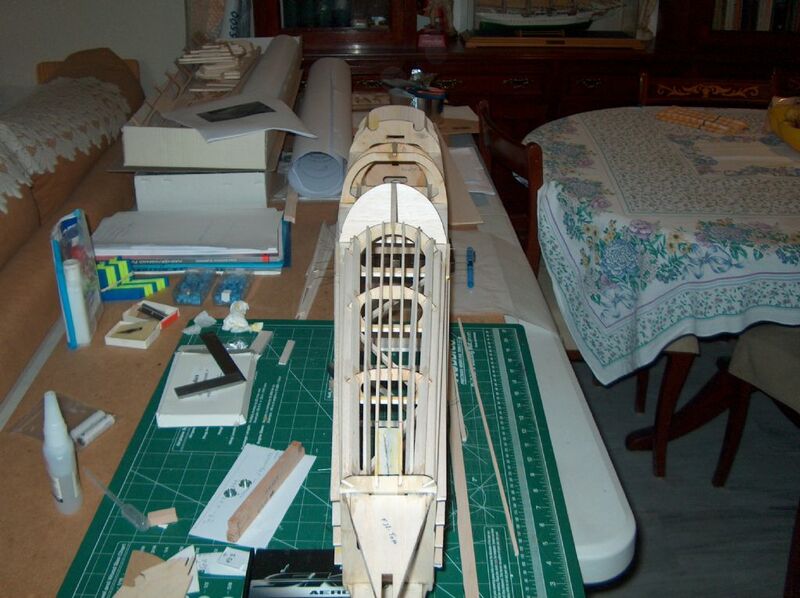 Added the 1/4 part with the slot for the tab of the fin. This is angled 3 degrees to the left as the original. The slot Will be enlarged when final asemmbly. Also added a central stringer. Not sure if the original has one. In some pics appears in others not so clear. (????). Note the side stringers that protrude in the F11 former. The excess Will be tapered.. 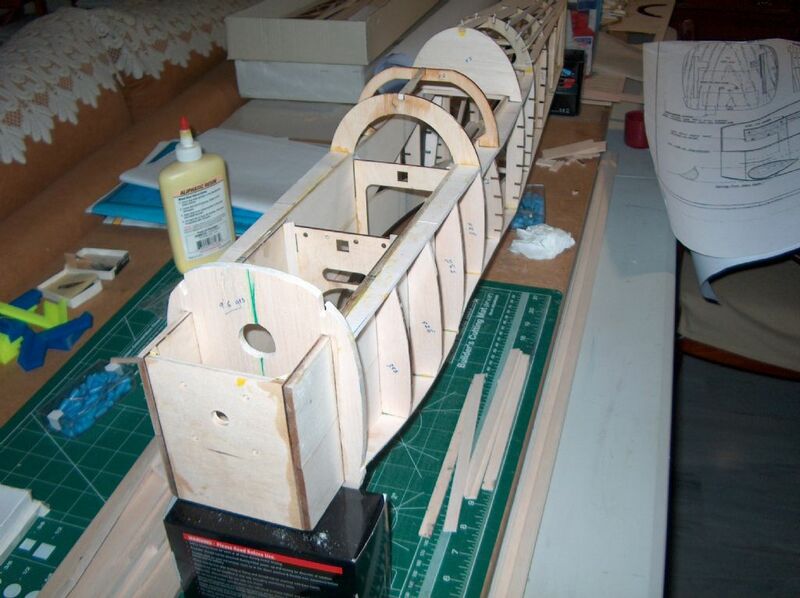 Working now on the tilwheel assembly and side panels of the tail support. Not too much to report on the model. Weekend dedicated to other things. As I had not fitted the top formers in the nose área. When I shaped the side of the croos grain 1/8" sheet i didn`t appreciate the diference betwen the top formers and the side formers. Today I glued the top formers and reshaped the side formers adding a slice of 1/82 sheet. 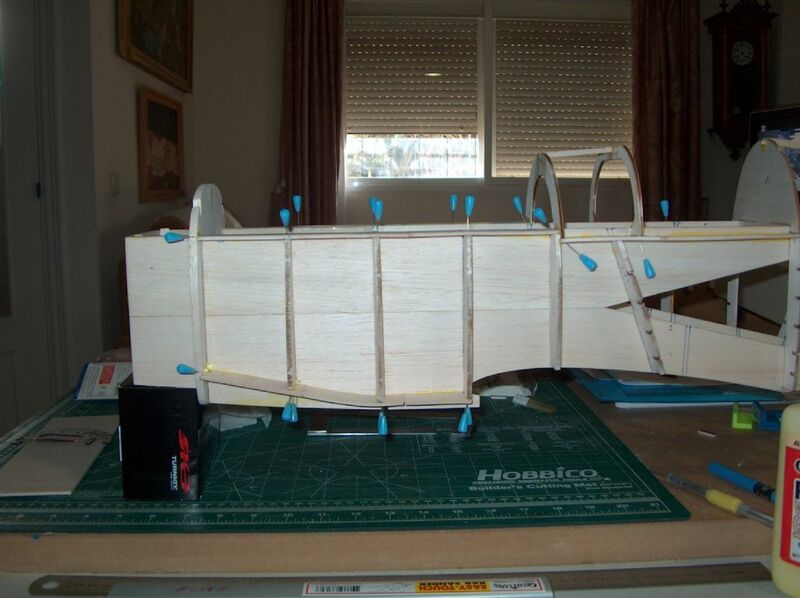 While I was waiting for the glue I prepared the formers that Will be part of the wing with the cabane struts and the hardwood bearers. I tack glued both with White glue and drilled in the pillar drill. 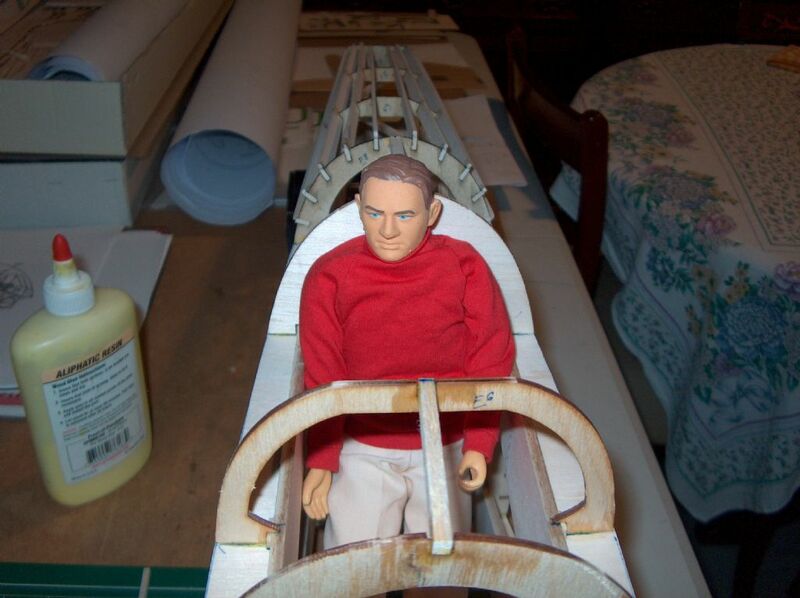 Also planning on cockpit detail…….Where are my instruments? Not the correct uniform, but correct scale. 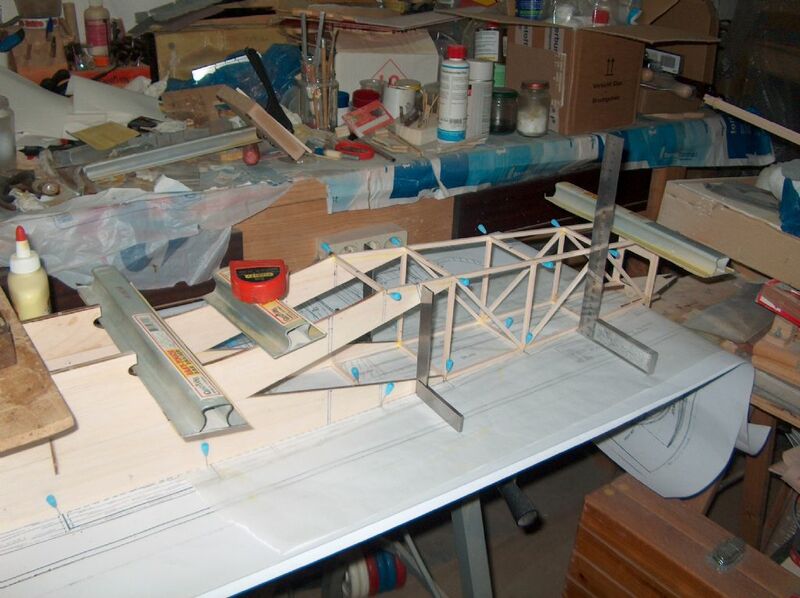 Do you have any drawing of the framework of the cabin area?. Anyone has info about the size of the tailwheel of the K5674 of HAC? 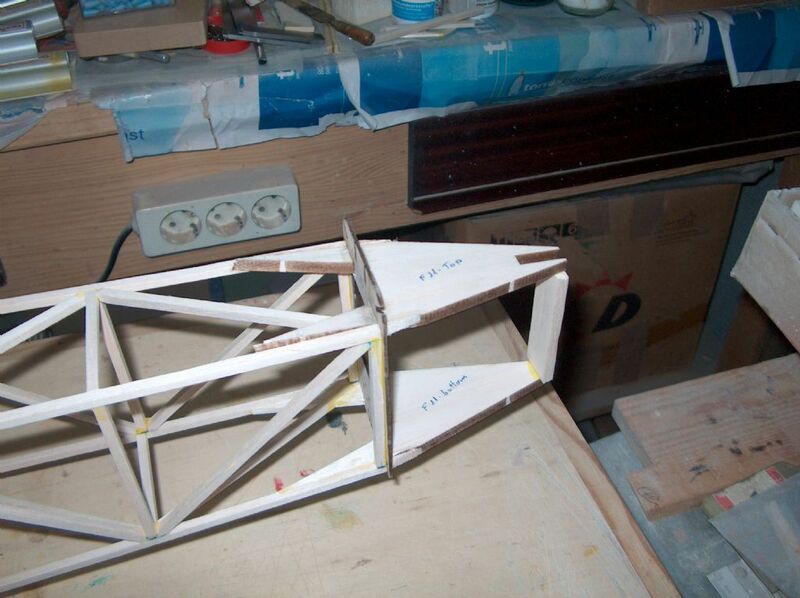 Today, Prepared the croos grain for the wing saddle, aligned and glued. 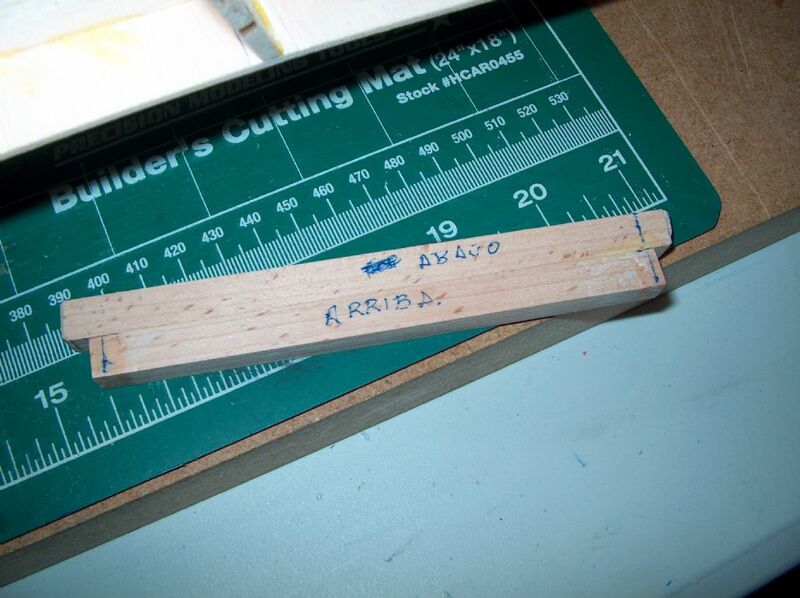 Also prepared from the scrach balsa the 3/16" longerons that go alongside of the main box from F7 to F10. 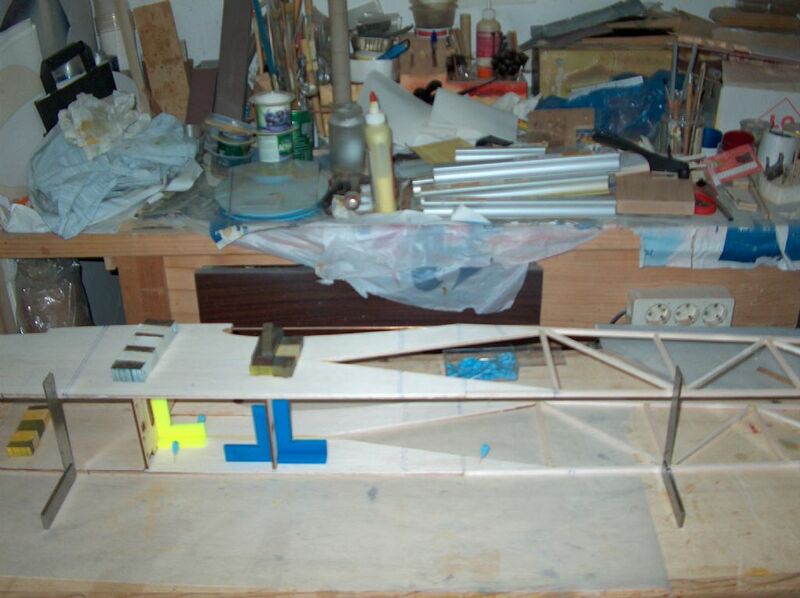 Using a sharpened brass tube drilled the base of the tail for the tailwheel. I discovered that I have put too hight the side formers at F10, so cut and reglue them. 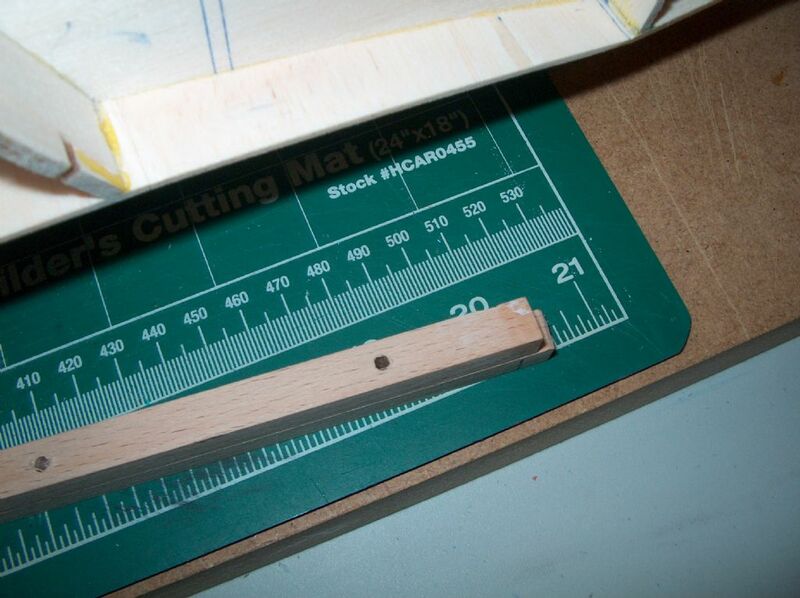 Marked the contour on the cross grained 1/8" using pins and a balsa stick as a ruler. Glued the top side sticks in F7 and F11. Once glued I put in their location F9 and F10. Once fixed I added all the top stringers. Sanded all the croos grain sheets and side strips. Drilling the hole for the tailwheel. Top stringers and botton longeron and wing saddle sheet. All the side sheets sanded Note the wrong F6 former. 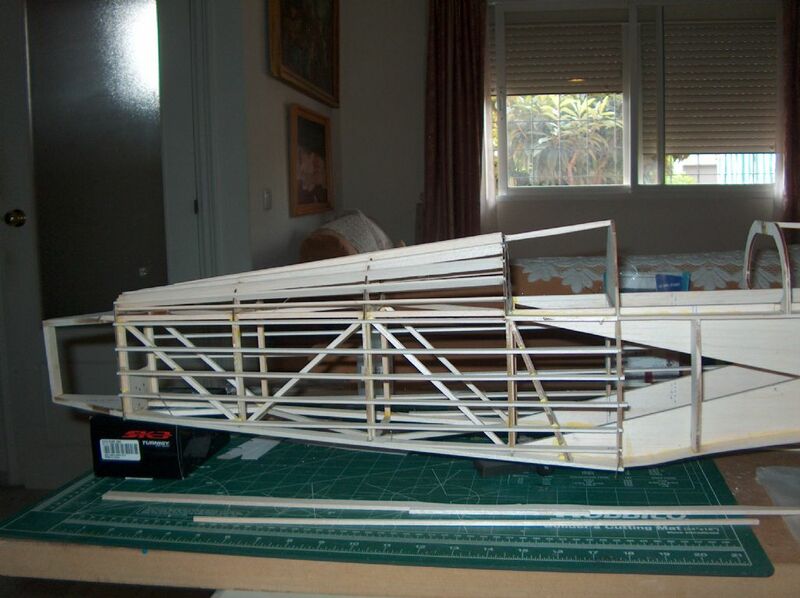 I`ll add a slice of balsa prior to sheeting. saddle sheet and bottom longeron- I have reglued a few tonges of the side formers broken during the sanding process. I`ll add the side longerons and sheet the fuse. The bottom Will be without longerons until the radio installation is finished. 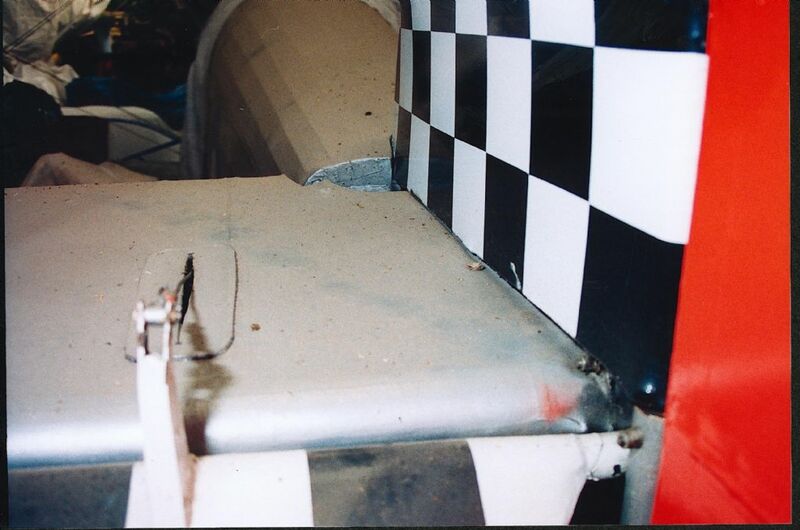 Any one knows the side of the tailwheel of the restored Fury? The cowl buts on F1 not over it. 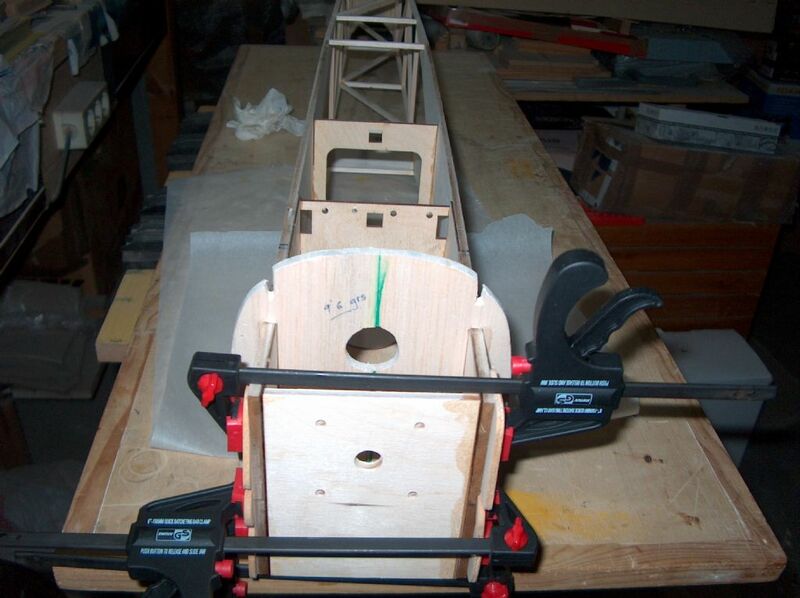 This is the balsa part I added behind the stringer at the end of the wing for supporting the stringers. Side view of the fuse. Visible is the motor box in the nose area. Yes , installing the last diagonals was a lot of fun, ……. Today I changed the workshop from the garaje to the main room…….. Begin preparing the 1/8" cross-grain that runs alonside the top of the fuse. Trued one Edge and used as a spacer for gluing all the vertical semiformers outside of the box. Finished at F4. Glued F5 and F6. Once dry glued the cross-grain parts. Also glued F7 and F8 and all the side subformers on the sides. Also glued the cross-grain sheet on the lower part of the fuse. 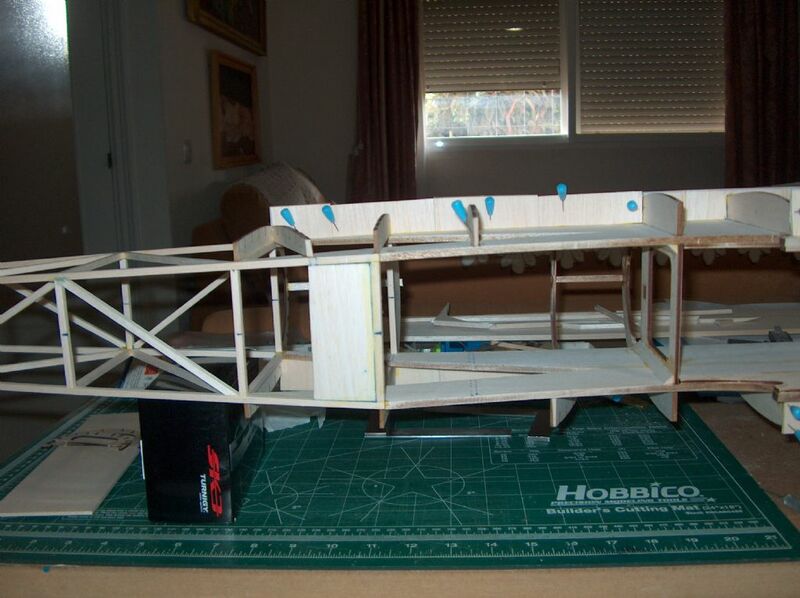 Tomorrow I`ll prepare the botom side stringers in 3/16" sheet and add the remaining top formers. 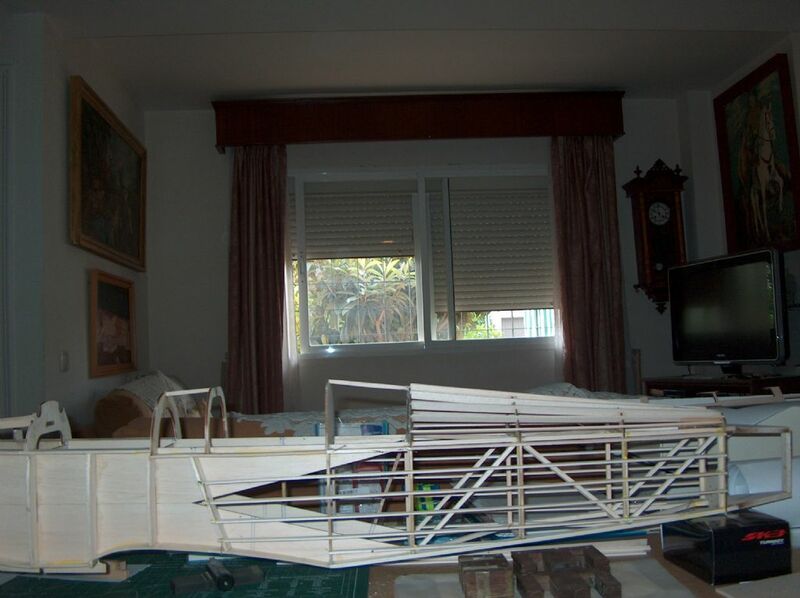 I was also thinking on three panel wings, but first I have to work on the fuse a bit more. Later prepare cabane and so on. Finished adding the diagonals to both sides, er…, top and bottom, but no in the end of F10-F11. Today lifted the fuse from the table, fixed F11 to the longerons. Glued the stab support giving their angle. 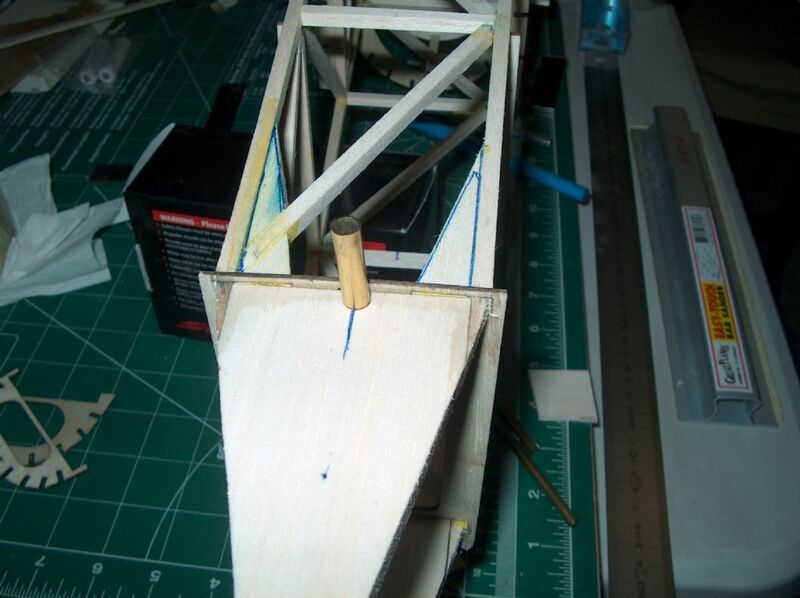 Glued the bottom part and added the 6 mm (1/4 " that Will support the bottom hinge of the rudder. Also added F1 and the motor support. 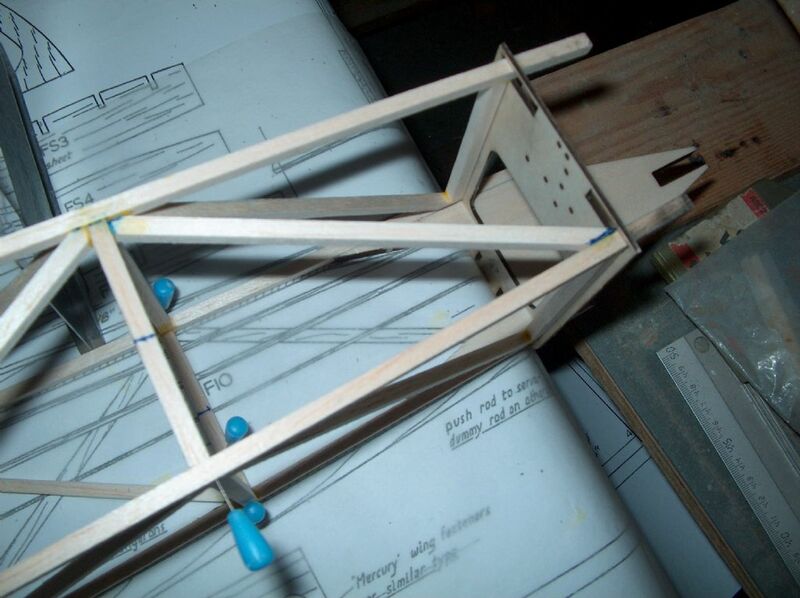 Tomorrow I`ll add some triangle stock in the motor mount, F3 and F4. Looking at the plan at F7 I have added a 3/16" cross over balsa behind the longeron at the base (You see this on the bottom view of the fuse). This piece Will support the underside longuerons. Hi. This pic shows that the elevators are joined by the leading Edge tubing. Today. I enlarged the top holes in F11. 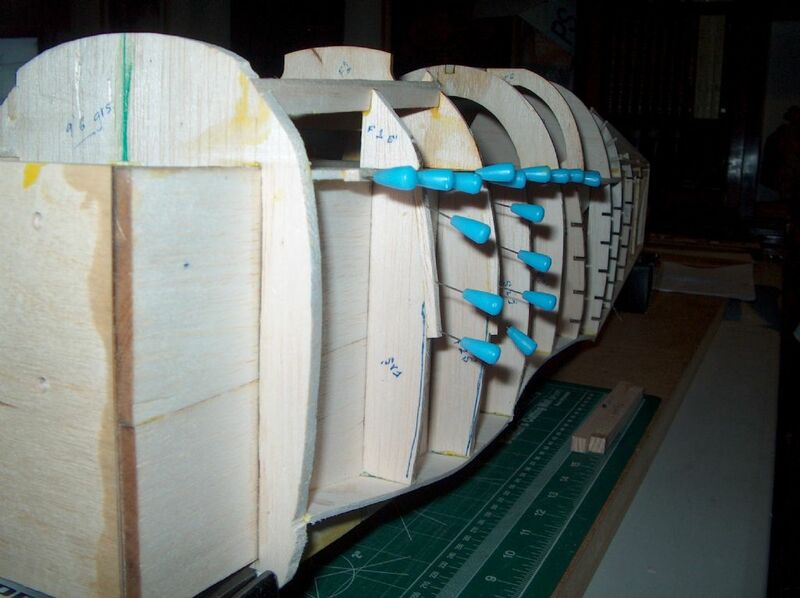 As the fuse tapers to the tail you must slot the stab support into F11 and later insert the lot betwen the longuerons that protrudes at the end of the sides. Next I made all the cross parts that go betwen the sides, marked the center on the parts and aligned the fuse over the plan. F11 is hanging in the air. Pinned and weighted the fuse and glued the cross parts. This afternoon I'll glue the diagonal ones. Once dry I glued both sides checking squareness. Nice have you on board again. Ernie put a pic of the parts description on the main thread. 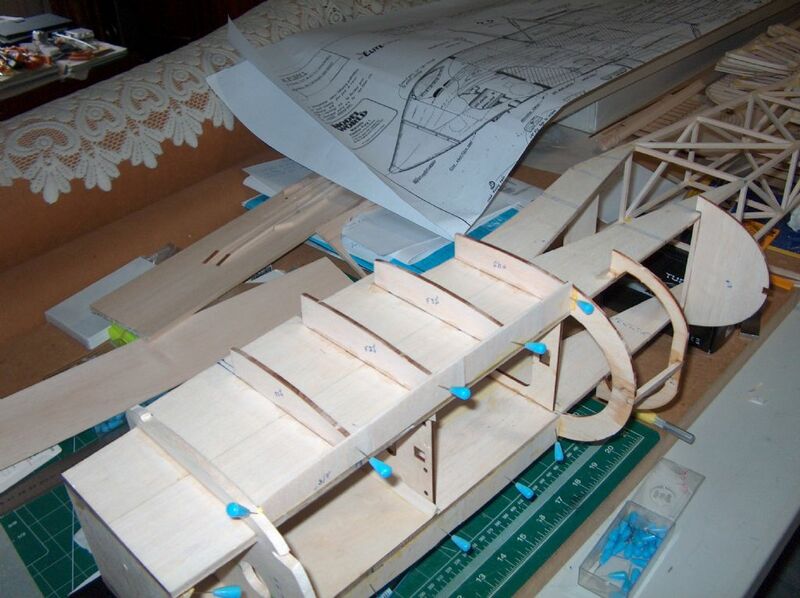 My Spanish Fury Will have some sprung undercarriage, not the Dowty because I have not the tools for making it. 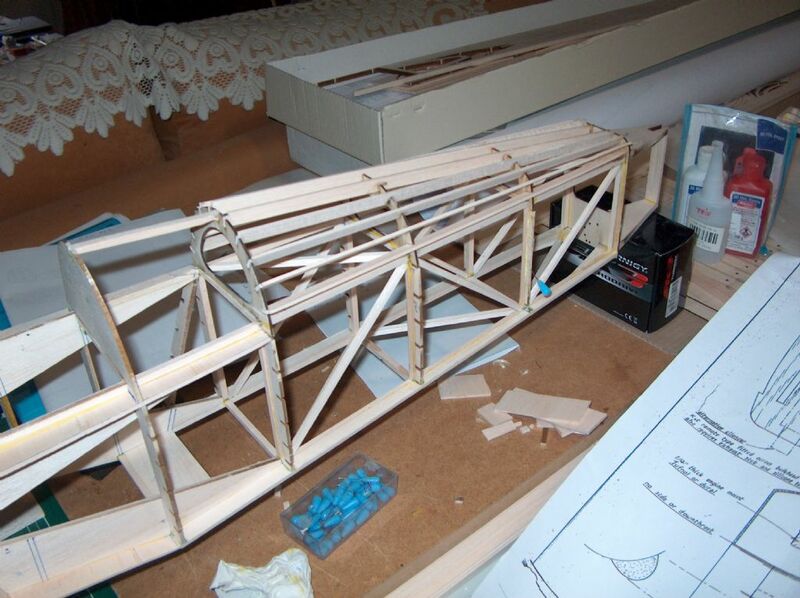 I have researched models with similar landing gear and almost all of them have a wire undercarriage faired with balsa. 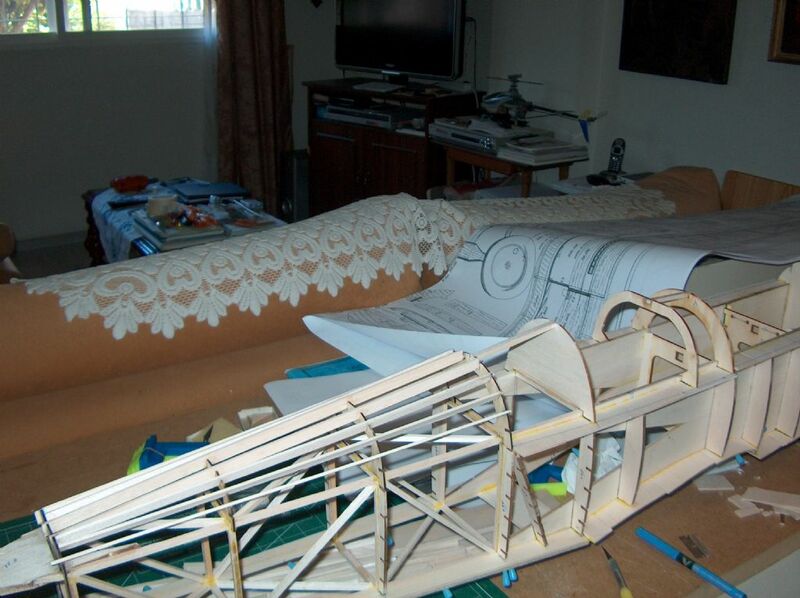 I´m going to take some compromiso and do a "Stearman" style landing gear with/without scisors on the telecoping part.disguised with paint. I think no one Will know if they are correct or not.